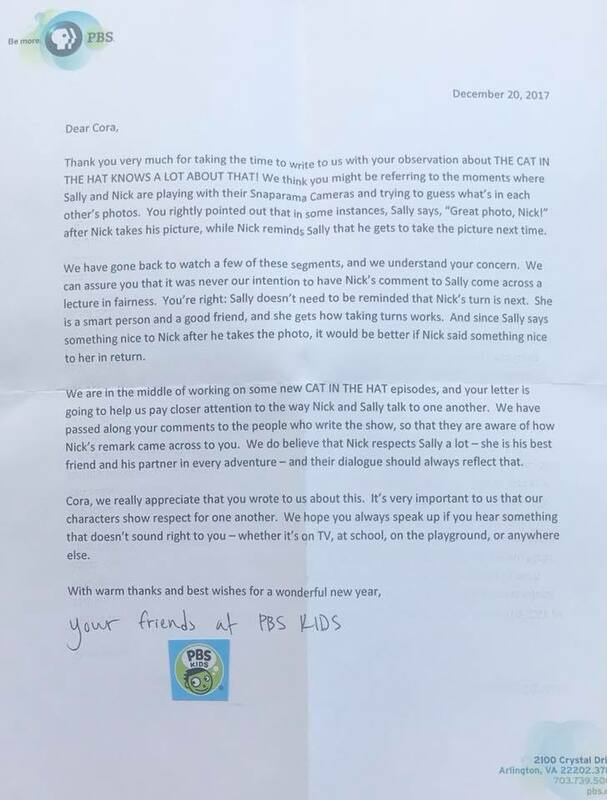 Several weeks later, PBSKids sent Cora a thoughtful, personal reply in which they validated her opinion, admitted that they could make improvements and assured Cora that they had passed her words on to the writers of The Cat in the Hat Knows a Lot About That. They encouraged her to “always speak up if you hear something that doesn’t sound right to you” and assured her that her criticism was appreciated. That letter and the response convinced Cora that she is a person with the ability to create lasting change for good. At age 6, Cora has no doubt that her voice matters and that she should use her words to speak out when she perceives injustice. She proudly tells anyone who will listen “I know I can change the world. I already changed PBS. But the truth is, it almost didn’t happen. When Cora came up to me with her criticism of the TV show, I only half-listened. I had hoped the show would entertain my kids long enough for me to cross a few things off my never-ending checklist and maybe allow me to drink my coffee in peace. I had not bargained on a letter-writing campaign. Later I dashed off a quick “isn’t my kid cute?” post on Facebook and a teacher friend suggested writing the letter, an idea that Cora jumped at. It is so easy for adults to talk over, half-listen to, or fully dismiss children like I wanted to that night. We do it without even realizing it, assuming that small people’s thoughts can be pushed aside for grown-up matters. The letter PBSKids sent to Cora reminded me of just how wrong that can be. Empowering kids today means building young people and adults who are the catalysts for change. It means hearing criticism and being willing to make changes based on a child’s ideas. There are four things that we can do with the children in our lives right now to encourage young people to become advocates for change in their worlds. TEACH children to name their feelings and provide healthy ways to process them. Truly listen when children tell you how they feel, validate their thoughts and ensure that they know their feelings have value. Put down the mental lists and really, truly listen. EQUIP young people to solve their own problems. This means granting decision-making power to children, allowing them to make mistakes and helping them rethink choices so they can succeed in the future. SHARE stories of ways kids have changed the world. Fill your home, church, school, and neighborhood with true stories of kids who identified a problem and made a change. Remind kids that not all changes have to be big to make an impact that is felt across their community. EMPOWER kids by providing platforms for them to make an impact. Family meetings, neighborhood service projects, community gardens, and congregational days of service learning all teach kids that they can shape their worlds. Be sure to celebrate each contribution. Most of all, live authentically. Serve as a family, create intentional time and space for open conversations, build trust by sharing feelings, and invite children to join in promoting the causes near to your heart. What if every kid felt empowered and encouraged to speak out the way Cora did? And what if they received encouraging responses each time? I imagine they would change the world. Thanks for this holy reminder of holy moments and holy people (children!). Embodied Faith: The ELCA Youth Gathering How do you measure what matters?